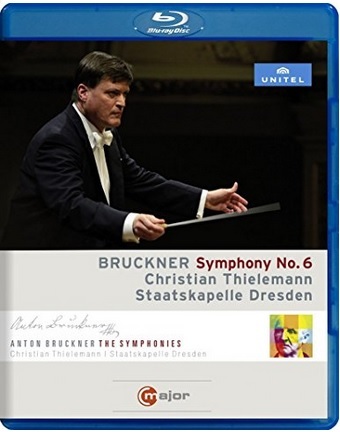 Thielemann’s Bruckner cycle with the Staatskapelle Dresden is now well past its mid-point, with this Sixth Symphony following similar DVD/Blu-ray releases of Nos. 4, 5, 7, 8, and 9. C Major has also released several videos of Thielemann conducting the Munich Philharmonic in Bruckner, although this appears to be his first commercial recording of the Sixth. Those who have been following the cycle will know what to expect, and this is a classic Thielemann account. His sense of line is everywhere evident, and his structural thinking always clear and impeccably communicated. The Dresden orchestra plays magnificently for him, and the close working relationship between conductor and players is evident both in the unity of artistic intent and in the minimal gestures Thielemann requires to express his vision. But if you don’t like Thielemann’s Bruckner, this Sixth is unlikely to convert you. To say that it lacks urgency is an understatement. At just under 57 minutes (excluding intro and applause), it is a slow account, although not exceptionally so. But the focus is always on breadth, with expansive phrases clearly defined and separated. Thielemann offers distinctive Bruckner, at least among contemporary interpreters, and if his musical values are old-fashioned, the conviction with which he presents them makes it easy for doubters to overcome their objections. The opening of the symphony is presented with particular delicacy, with Thielemann giving minute gestures, which the strings follow in their timid repeating-note figures. A steady pace is maintained throughout the movement, with the exceptional tonal support of the winds keeping the rich tone afloat. Audio quality (listening in PCM stereo—5.1 is also available) is good, but there is an unusual emphasis on the woodwind soloists, especially the clarinet, whose accompaniment figures often stand out, even from tutti textures. Seeing the players close-up helps to focus attention on their individual contributions, and, although this isn’t a particularly horn-dominated symphony, watching the first horn makes you realize just how important his contribution is. The duet between horn and oboe at the start of the first movement coda is exquisite—a real highlight of the performance. In the Adagio second movement, it is the turn of the strings to shine. The Staatskapelle string sound is rich, unified, and anchored in a satisfyingly solid bass, all of which comes through in this movement. The Scherzo is given a weighty and emphatic reading. Bruckner writes Nicht schnell, and Thielemann takes him at his word, although still manages sufficient contrast with the Langsam Trio. The richness of the brass tone is a defining feature of the finale, achieving a heroic, strident quality, but always within moderate dynamics. The video direction, by Henning Kasten, is constantly mobile, but never to distraction. Close-ups predominate, and long shots always involve slow pan or zoom. Portraits of Thielemann appear all over the packaging, so it is no surprise that the camera continually returns to the podium to pick up his many small gestures. The Semperoper stage provides a good, spacious arena, especially as Thielemann conducts without a score, and microphones and cameras are well concealed, the mike heads just peaking over the players’ stands. A classic Thielemann account, then, and a committed reading of one of Bruckner’s less loved symphonies. The sheer consistency of this cycle is one of its greatest strengths, with Thielemann giving as convincing an account here as of any of the later symphonies. If he can maintain that standard through the earlier works, where even more inspiration is required to maintain coherency and focus, this could shape up to be one of the more impressive Bruckner cycles of recent years, one where, if you love a single installment, you’ll love them all. Lyricism and drama are distinctive features of the best symphonies of Bruckner. This composer gave us amazing music.